Mica Hill hiking trail takes you to the top of the highlands plateau. 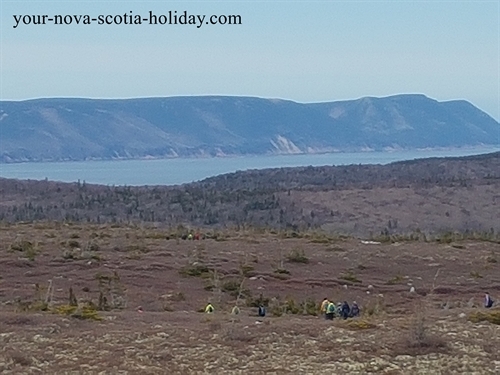 Mica Hill is one of the most interesting hikes in the Cape Breton Highlands National Park. You will already be high on the highland plateau when you start this hike. You will then gradually climb higher. 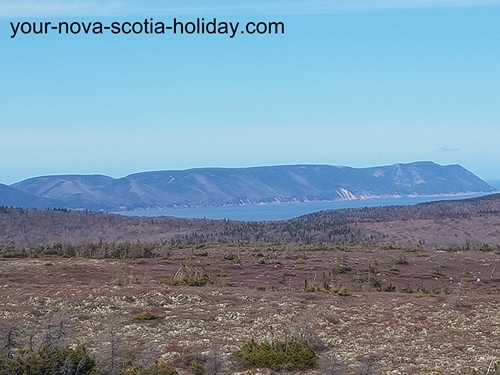 The end result will be a 360 degree view of the Eastern coastline of the Atlantic Ocean including St. Paul's Island, Cape North, Asby Bay, Sugar Loaf and Cape Smokey. This is a pretty special place so get ready to enjoy. 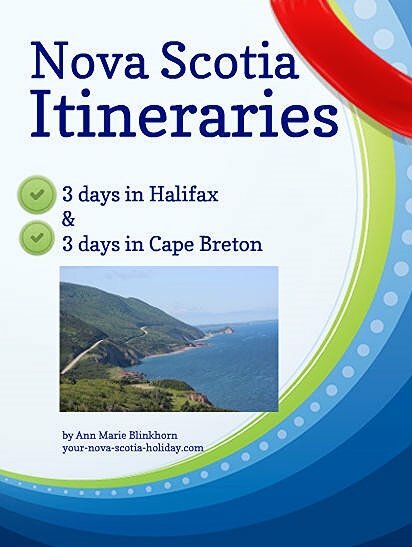 Directions: This trail is located in the Cape Breton Highlands National Park in northern Cape Breton. It is in the eastern side of the park in the Ingonish area. The trail is marked #14. If you are entering park via Ingonish stop at the Visitor Information Centre just before the park in Ingonish Beach. You'll need to pay an entrance fee to the park. 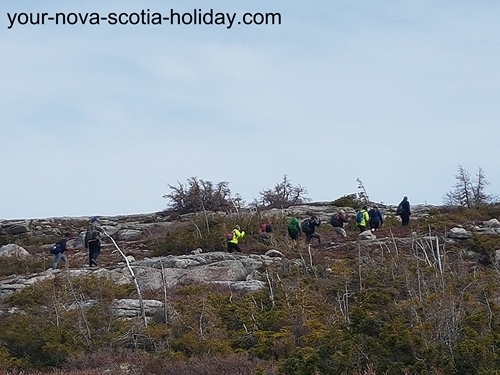 The fees are very reasonable and you'll need to pay a fee even if you are only doing a day hike. When you are in the VIC make sure you ask for a map of the park. This map will show you where all the hiking trails are located. Look for #14 for Mica Hill. It is about 30 minutes from the VIC. Remember that you are on the Cabot Trail even when you enter the highlands park. Level of Difficulty: This is not a difficult trail but it is long. So be prepared for a long hike. It is a gradual climb but very doable. The trail is well maintained and there are even some small viewing platforms along the way. But it can be wet especially in the spring or after a rainfall. Food/Water: Lots of water is needed on any hike. A snack for when you reach the top of the plateau is a great idea. Clothes/Accessories: It can be quite windy at the top so a jacket or sweater might be needed. I always use a walking stick when I hike and was very happy that I had it. I think a hat is necessary on all hikes. Bug repellent might be necessary depending on the time of year. And, don't forget the camera!! Facilities: There are no facilities on this trail. Mica Hill is a fantastic hike. Because you are high in the plateau there are no tall trees so there is a lot of space. You will feel like you are in Middle Earth. Really!! It is a great feeling. This is the hike for you if you want to experience the highland plateau. There are a couple of platforms on the trail so you can view your surroundings and start to get a view of the ocean. You'll see North Mountain, Tenerife Mountain, Sugarloaf and Money Point to the north almost immediately. 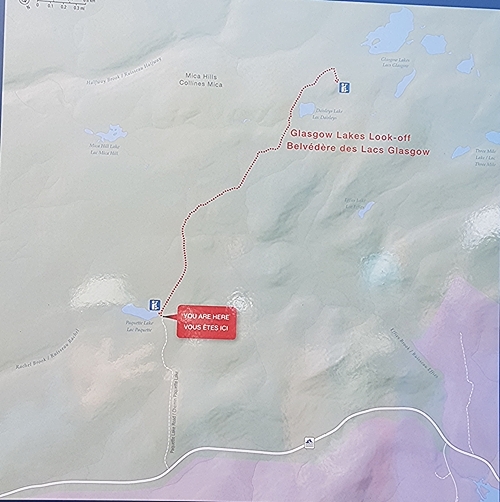 I did this trail more than 20 years ago when it was called the Glasgow Lake trail. I knew it was awesome but forgot how much I actually loved it. The trail can be quite wet at times so I suggest you wear good hiking boots. 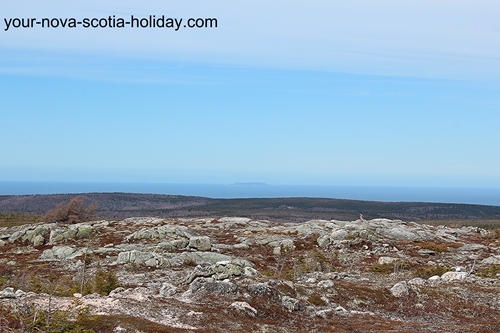 The trail is very open because there are no tall trees or bush this high on the plateau. This means you are open to the elements so be prepared. The wind swept plateau and taiga are quite impressive. Take your time and enjoy the view once you reach the top. Try to do this hike on a sunny day. You'll be able to see further. Stay on the marked trail at all times. It is very easy to lose your way here. 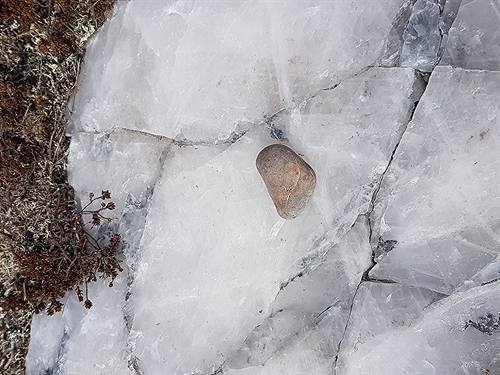 You'll be treated to a rare display of quartz and mica when you reach the plateau. Mica is a white mineral that was extracted from this area years ago. You’ll see that it is very thin and almost transparent. Also note the white outcroppings of quartz. Please do not remove any pieces of mica or quartz. 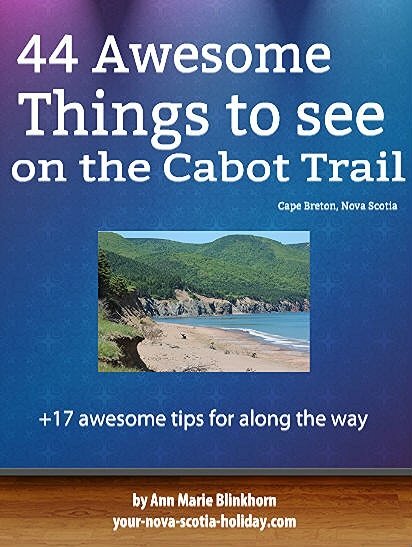 This trail is located on the the northern part of the Cabot Trail is in the Cape Breton Highlands National park. This is a fantastic area for spending some vacation time. The highlands national park is full of great activities for everyone. 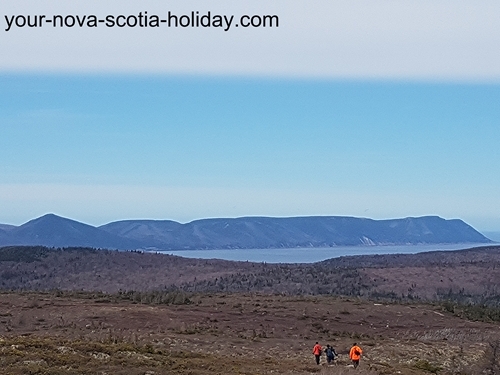 Check out my information about the park in the Ingonish area and you'll see great opportunities for camping, golfing, hiking, sightseeing and spending some time at the beach. The Visitor Information Centre (VIC) for the park in Ingonish will be able to let you know of any current activities happening during your visit. There are also great accommodation options in this area. I always use Trip Advisor when looking for a place to stay. Always helpful with lots of customer comments. Check Trip Advisor for restaurants too. Very helpful! Have you hiked to Mica Hill? Do you have a great story about it? Please share it with us! Enter a title for your story!